i think that there are upsides to either approach. again, as a novice i don't have any professional experience to draw from, but humor me a minute. with the team approach, you get a consistent character with less struggling (potentially) but with a shot by shot approach, you have the potential to assign shots to animators based on their individual skills, potentially allowing the acting to be stronger. another point is that a lot of these films (let's face it) will have sequels. so who's better off in that situation? the studio that has played to the strengths of the performance, or the studio that has gone for a consistent character? dunno myself, but with hollywood pushing so hard for sequels, it's something that should be considered. Interesting thoughts. Hwever a good supervisor knows enough to make sure they get animators of all skills and strengths on their team. So casting still happens in a character team environment. As for sequels, who knows? I don't know that one way or another favors the successful milking of a cash cow. Heh. Actually, I believe Disney doesn't work like that. They had character supervisors that worked solely on their character, on the most important shots (with one or two exceptions). Nick Ranieri for Buck Cluck, Jason Ryan for CL, Tony Smeed for Ugly Duckling, etc. Then there was the animation team, who just animated all characters in a shot on a shot by shot basis, and turned to those supervisors for advice on each character. I know that some would prefer to do it the way you've described it, but I don't think they're doing that right now. And about the strong acting vs. consistent character. First of all, a supervisor is going to give his shots to the animator best suited for the job anyhow. Secondly, if you spend months and months and months working on one and the same character, you'll get to know it so much better, imo, and they'll start to act it out for you. I've heard that Glen Keane says this, that there's a point where his character turns real for him, and that he can almost see him walking around the room, and that the acting then becomes natural. Keith, my question is related to your article: Which kind of Facial expresion model sheet are using CG Animators doday to keep the character expresions consistent during production? In CG often times a facial or phoenetic shape library for a character is created by a lead or senior animator, then approved by the animation director/supervisor. 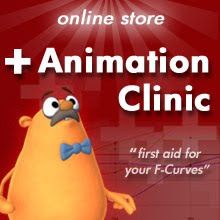 This shape library is then used by the animation team in production shots. It's like soup stock. You're not going to just mix up chicken broth and serve it, and in the same way you're not likely to just use the shapes from the library as is. Instead you'll use them as a starting place, a default basis from which you can customize the face or speech for a specific shot. The character/team system is actually pretty loose on Open Season. If you go to Michael Barrier's site, he talks about this subject regarding Disney back in the day. His most recent entry (from September) refers to an August 26th entry (he doesn't have individual links to his posts) on multiple actors performing one character. There's some more in his posts, but you'll just have to poke around. Very interesting conversation, I have to say.